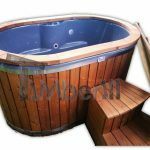 Hot Tubs for 2 Persons. 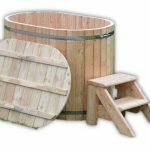 Wooden; with fiberglass or Polypropylene liners. Much heavier compared to PP or fiberglass models. Much lighter compared to wooden models. Not completely natural product due to fiberglass interior frame. Much lighter compared to wooden hot tubs. 5 different wood types possible (Siberian spruce; larch; thermo wood; oak and red cedar). 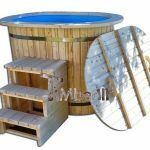 Price is slightly higher compared to wooden hot tubs.